Arginine (Arg) is an essential amino acid that chickens need a daily source of in their diet, for its role in protein synthesis. 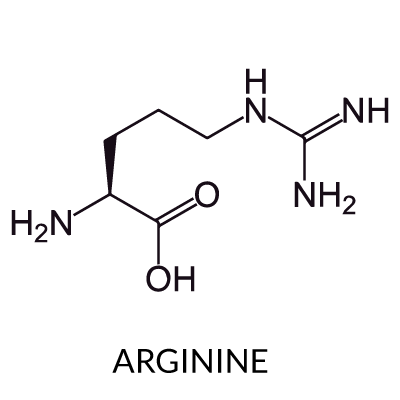 The NRC (1994) recommends that chicks up to 21 days of age receives between 0.78 to 1.25% of arginine in their diet. Arginine has been associated with improved immunity and disease resistance in commercial broilers against Salmonella enteritidis and other organisms. Arginine deficiency occurs when chickens aren't receiving enough arginine contained in the protein levels in their diet. Arg deficient chicks are at risk of impairment of the immune system functions, leaving them more susceptible to invasion by harmful pathogens. It will also result in decreased productivity or growth. The protein and amino acid requirements of chickens varies depending on the age, breed, environmental temperature, and use of the bird. Genetic differences occur as a resulting from differing digestion efficiency, nutrient absorption, and metabolism of absorbed nutrients between breeds. Young growing chicks and laying hens require more protein and amino acids than a mature rooster. During warmer temperatures (above 24°C (75°F)), chickens may require additional protein levels. Laying hens on a diet with 1.36% digestible arginine (1,872 mg/d) was shown to be the optimal amount for female broiler breeders during late laying periods, as determined by a study conducted by Duan X et al in 2015.